The moment their order arrives, Archana Reddy and Sangeetha Rajesh turn into jittery youngsters excited about new games to play. 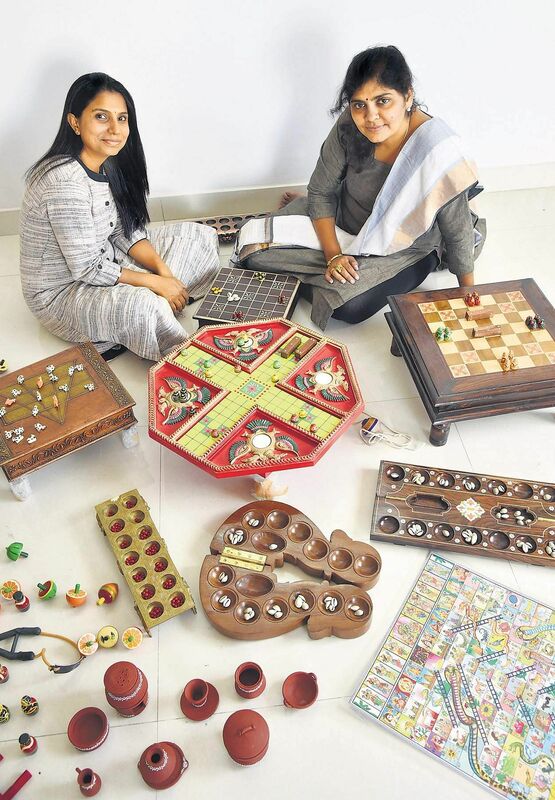 “We’re usually more excited to play our own games and about how they look and feel than selling them,” says 36-year-old Archana, who started Good Old Games exhibits with Sangeetha to revive age-old indoor games. The duo organised their third exhibition in Saptaparni, a public cultural space in Hyderabad’s Banjara Hills in August, which was “a big a hit among elders”. “We are possibly the last generation that can pass on these games to our offsprings. Digitisation has taken over childhood. Only if we expose our children to these traditional recreational games, will they ever stay from going extinct,” says 40-year-old Sangeetha. Despite being friends for over a decade, both came together with this project due to their association with children. Both of them have been teachers. Sangeetha, who still runs a pre-school, says, “One day when I was making one of my students practice handwriting, he said, ‘Why should I learn this when I could hit a button and ‘A’ appears?’ That’s when I realised how much we have become accustomed to technology,” says Archana. Their love for everything traditional extends to the raw material they use for their games—a Pacchees table with mirrorwork, Ashtachamma board drawn on a Kalamkari cloth, wood-carved Vamana Guntalu and engraved antique marble tiles. “We brought back the card game called Ganjifa, which was played by kings and rulers 4,000 years ago,” says Archana. The designs and games are made by handloom and handicraft artists in Tamil Nadu and Telangana, and are on sale only through their Facebook page and when ever they host exhibitions. The duo says that they have never seen it as a business on which they are looking for a return or profit. “I often play these games with my 10-year-old daughter. It helps me bond with her as well. I also find out more about her about how she reacts to winning and losing. It’s a great chance to teach her about how to be composed in the face of defeat,” says Archana. They both have their day jobs to keep them afloat, but Good Old Games is more than just a brand for them. “We are doing it for the love of it and thankfully, the response to all our exhibitions have been great. Our main intention is to get bring back what our ancestors taught us. Because if not us, who will,” says Sangeetha.